There's something very special about a printed book that no amount of e-books in the world can replace. Upon a recent quest for new and noteworthy coffee table books, there was one book among the masses that caught my attention. 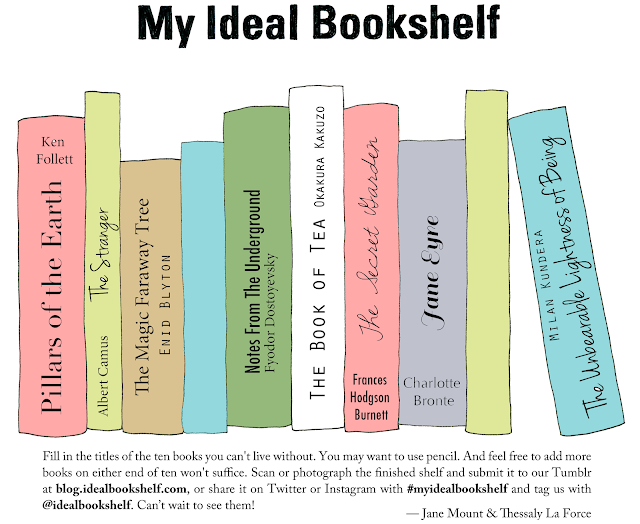 It's called The Ideal Bookshelf by Jane Mount (November 13, 2012). While some may liken this book to Kramer's infamous coffee table book on coffee tables. For the avid reader and book enthusiast this comes as a window into the homes and minds of leading cultural figures as they share a collection of books that matter to them. Upon flipping through the pages you start to realise how little of the literary world you have actually conquered as you slowly take mental notes of titles to add to your reading list. 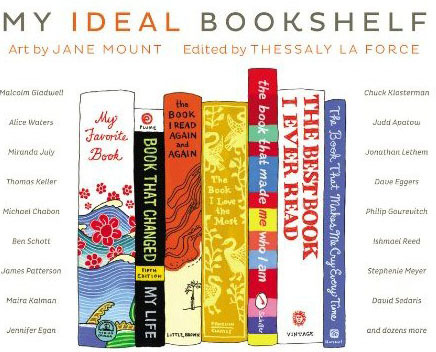 If you are ever at all curious about what other people read, then this one's for you. "People who need to possess the physical copy of a book, not merely an electronic version, believe that the objects themselves are sacred. Some people may find this attitude baffling, arguing that books are merely objects that take up space. This is true, but so are Prague, and your kids and the Sistine Chapel." I'm staring to get off topic, but then again that's the beauty of the written word. One thought lead to another to another and soon you have a full discourse on the meaning of life. But I digress again. Since The Ideal Bookshelf is all about the books that define us, I couldn't help but ponder over the very same question myself. Which books have defined my life? Which books do I turn to? Which books have altered my course of history? The list in the picture above was no small feat to compile, in fact I had trouble filling in the titles of all ten blank books. I guess I have a lot more reading to do. If you've made it this far then I must apologise for the heavy nature of this post. Don't worry it's back to my usual frivolous writings in the next one. available >> here and here. Do you have a favourite book or reading list to share? What books have defined your life? jenee, i agree. i love a book that you can feel and flip through. i don't have an e-reader yet and i'm still on the fence about purchasing one. i did get rid of a lot of books, but couldn't get rid of the one's that were truly special to me. as mentioned above, some are too sacred to get rid of. a book that really hit me was memoirs of a geisha. i know it's an older book, but it was so compelling, i read it in like 3 days. there were so many life lessons. i truly loved it. excellent post! more people need to read more often. I totally agree with you on this, even though I love blogging I hope printed media will stay a long side it. Currently trying to find a nice bookshelf for my boyfriends apartment! This is so shallow but when I was a teenager I was obsessed with the Great Gatsby. I had never heard about this before! My favourite book would be The Catcher in the Rye. I have to agree. I prefer printed books than e-boks esp the older one's, I so love the smell. I still haven't made the switch to e-book beause I LOVE flipping through the paper ones. so I can pass it on to my children and grandchildren, the book that changes their parents/grandparents life! Although I use and read both e-books and paper, there's nothing like the printed word, flipping pages of a favourite book. I love Pillars of the Earth and Jane Eyre. Good reads. I have not read a book since completing my MBA program and prefer a real book and magazine over the e version. I'm a bookworm. The problem is we move around a lot. When it comes to fiction, it has to be e-books. Non negotiable. However, I just can't deal with electronic format when it for cookbooks, travel or reference books. I've tried and failed miserably. You are preaching to the choir here, I love books, my whole house is books. I am a writer and even writing on paper is so different, and more inspiring than doing it online. Any way, thanks for coming by yesterday, your comment made my day, I just browsed your blog and I love your style. i started following you on GFC And Bloglovin, keep them coming! This is such a lovely post! I had never heard of this book before, but now I want it desperately hahah. Your picks are great, though I've only read a few of them (Secret Garden, the Stranger, and Jane Eyre...and I've loved them all). I definitely mainly read e-books now, for the sake of convenience, but truly, nothing beats that feeling of cracking open a printed book. Love this post so much! :) I am a huge fan of the e-reader but mostly because I read so fast I can keep multiple books on hand at once! Makes it easier for traveling, that's for sure! What a cool book! 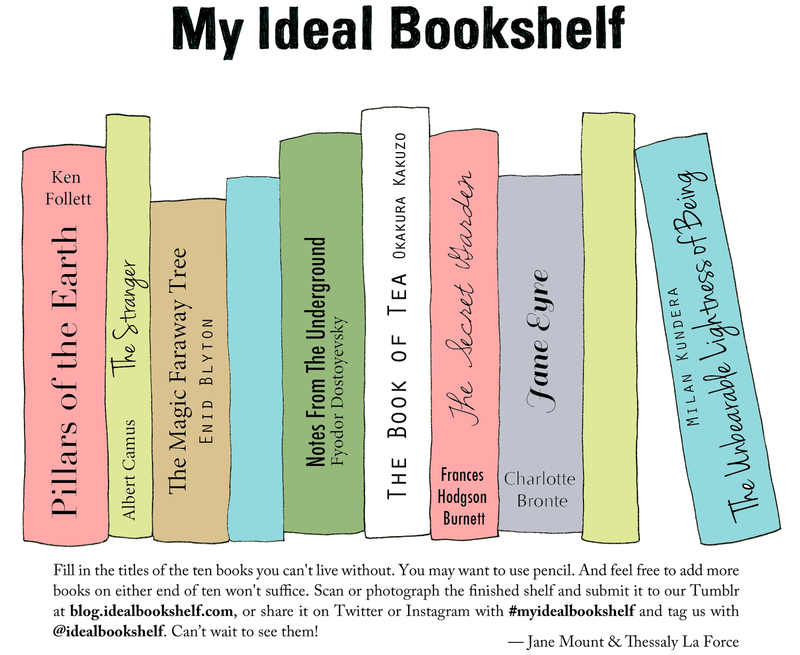 I love my books and have no desire to get an e-reader! I love seeing all my books on the shelf!